International soloist, founder-member of Trio Gaspard, and Guest Principal Cello of the Scottish Chamber Orchestra and Oslo Philharmonic Orchestra, Vashti Hunter makes her debut with the Amati Orchestra in the Dvorak Cello Concerto on Saturday November 26th. 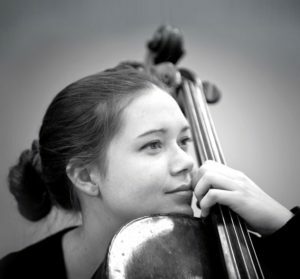 We sat down with her to discuss Prague, Berlin, and her philosophy on cello technique. You are the first British Cellist ever to be awarded a prize at the International Cello Competition “Prague Spring” in its 65 year history. What impact did this competition have on your career? With hindsight I think the competition had more significance artistically than it did for my career. It was a huge achievement for me to reach the finale of this renowned competition and to perform my favourite concerto in a hall named after the composer, where he himself conducted. It was an awesome (and slightly terrifying!) experience which I will never forget. Unfortunately no major concert invitations came directly as a result of the competition, but it certainly boosted my confidence and was something substantial and prestigious to add to my biography, which has in turn led to many interesting performance opportunities. The Dvorak Cello Concerto was the work with which you won your Laureate. You will perform this concerto with orchestra three times across Europe in October and November alone, including with the Amati Orchestra. What is it about this piece, in particular, that draws you to it? I started learning the Dvorak relatively late, when I arrived in Hannover to study with Leonid Gorokhov at the age of 23. I was invited to perform it with an orchestra in Braunschweig at quite short-notice, so was really thrown in at the deep end. It was a huge endeavour as the work is a symphonic masterpiece, demanding the utmost emotional maturity and technical finesse from the soloist. I remember living and breathing the piece for those months leading to my debut performance in Braunschweig. I think what draws me to the Dvorak is that it is one of the most monumental works in the cello literature, as well as the most satisfying to discover and perform; I feel as though I am telling an epic story when playing the piece. It is one of the most glorious and poignant concertos written for the cello, and I look forward to many more opportunities to retell the story, including with the Amati Orchestra in London! You are a British Cellist, a soloist around the world, and guest Principal Cello with orchestras such as the Oslo Philharmonic Orchestra and Scottish Chamber Orchestra. Yet you live in Berlin. What was it about the German capital that attracted you? However, the saying goes between musicians in Berlin that we hardly ever see each other, and this is true! Many are based here but perform elsewhere. A lot of my concerts take place all over Europe, and further afield, so I am nearly always on the road! Another important reason for choosing Berlin was because my ensemble, Trio Gaspard, is based in Germany. We will be performing at the Berlin Philharmonie on the 14th November, so it’s a great opportunity to enjoy some time at home! Leonid Gorokhov is currently your mentor. If we may say so (! ), you do make playing the cello look very easy! You appear to be so “loose” when you play, almost like a cat toying with a mouse! You also exude a considerable amount of charisma, and have impeccable musical timing: is there something in his teaching, or your approach to playing, that helps you to play ferociously difficult works with such (apparent) ease? I am flattered, thank you! Freedom whilst playing is something I am constantly preoccupied with. It is as much mental as it is psychological, and requires a lot of focused energy and attention. Leonid Gorokhov significantly changed my concept of freedom on the cello. He helped me to recognise that extraneous movements are unnecessary and act as a way of masking our insecurities and nerves. A lot of these kind of unnatural movements (twitches, sharp movements in the body or strained facial expressions) stop us from listening to the actual sound being produced, and instead encourage us to deviate from the real essence of the music. He used to say that ‘when your mind is liberated you can become creative’ and this is so true and something I strive for. The moment you tense up, you are restricting yourself musically and creatively. I try always to search for the most natural posture and movements whilst playing as this gives me freedom to focus on what I really want to say in the music. Trio Gaspard was formed in 2010. Since then, you have won 3 major international competitions. The trio is made up of international soloists, from the UK, Greece, and Germany. How did you meet, and what do you want to achieve together? Trio Gaspard was founded in 2010 with Greek violinist Jonian-Ilias Kadesha Korean pianist Hyo-Sun Lim and myself. We were very fortunate to win three major competitions in our early years as an ensemble before starting to forge a career. Hatto Beyerle was (and still is to this day) an enormously significant figure in our development as an ensemble. Hatto was one of the founding members of the Alban Berg Quartet and Wiener Soloists, and went on to become one of the most famous and successful chamber music professors, coaching ensembles such as the Hagen Quartet and the Jean Paul Trio. He taught us from the very beginning and was always there to give us any advice we needed, or to help recommend us to influential concert organisers. He very importantly suggested we ask Nicholas Rimmer to join us when our pianist got a job as professor in Korea and had to leave the group. As soon as we played our first few notes together with Nicholas three years ago, we knew immediately that Hatto had made the perfect choice of pianist! Our future plans include visits back to the UK as resident ensemble of Dartington International Summer School, concerts at Budleigh and Harrogate Festivals, a recital at Belfast Arts Festival recorded live by the BBC, with a Trio commissioned by Irish composer Gareth Williams. We also have many exciting projects in Germany and elsewhere, including our Berlin Philharmonie debut concert, recorded live by German Radio and recitals in Northern Italy and at Gragfenegg Castle in Austria. I suppose we want to achieve a really successful career and play as many interesting concerts and works as possible! You have an extremely busy diary, and are involved in a multitude of projects around the world. What are your plans for the future?